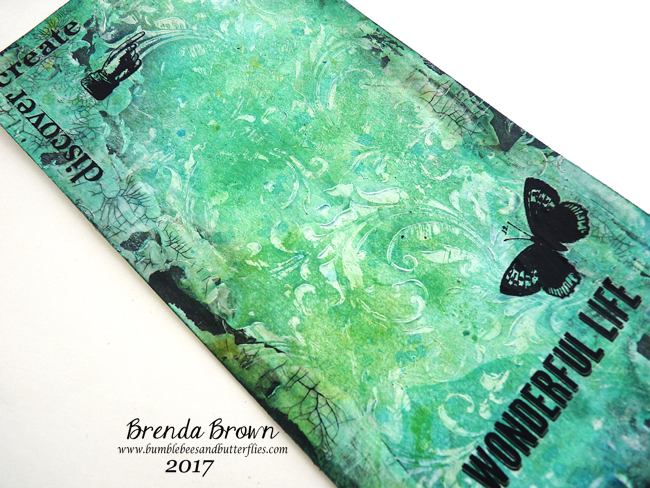 Welcome to Bumblebees and Butterflies where today I am sharing another journal panel using a gesso resist technique. Sorry I got so into the moment with the process steps I kept forgetting to stop and take photos, but I will add this to the Technique Tuesday posts at some point. Take a stamp and using the dark side of a piece of blending foam gently blend gesso over the surface of the stamp and then press it onto a piece of card. It leaves you with a semi textured design. 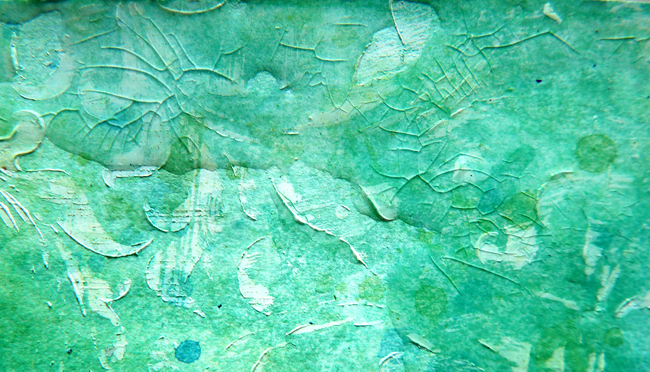 Dip and dry layers of blue and green paint washes dabbing the paint so that the gesso pattern appears. Because we didn't seal the card to begin with it absorbs the colours really quickly. I splattered some watery paints and dried them before taking a palette knife and scraping some clear crackle glaze around the edges, then left it to dry naturally. Now came the decision keep this light and shabby with perhaps the cracks not showing up to well or go more grungy and darker? You can see which I chose. I took carbon black antiquing cream (wasn't I brave????) and rubbed it round the edges exposing the cracks and gaps in the crackle paste. The result surprised me but I actually quite like it. To finish I decided to give it a dirty blue glaze using ultra matte varnish to seal it and then add some remnant rubs and stamping so that it could become the back cover to my journal. The glaze also takes off the shine of the crackle glaze. I'm looking forward to sharing more of the journal once I get the inside panels made - then it will be up and running ready to fill. I love the shading of the colors and the texture. I love how this looks. I find myself scrolling up and down over and over just enjoying looking at it. Yes, you were definitely brave when you picked up that black. But you somehow knew it was the perfect choice. Scrumptious gesso resist, and I love the full-on highlighting of the crackle with the black antiquing cream. What a great look. I'm going to try this. Thanks for the step by step to help me. Another great tutorial Brenda and I really do forget to use Gesso for things other than a base layer!! Fabulous blue and green blends and the black really adds a fabulous dynamic - the perfect choice imho- but then as you know I am a love of Black , lol. Gorgeous . Oh yes! I quite like the black you added!! Looks beautiful!! May I ask you to share the link of the journal size die you use? Aren't we always surprised at how our mixed media turns out--never the same twice for me! I'm loving this grungy crackled sea foam looking panel! Thank you so much for even more inspiration and for sharing so freely on your blog! You inspire me much more than you will ever know! Hugs!